Bjarke Ingels has unveiled his firm's new stadium design for American football team the Washington Redskins, set to feature a moat offering an assortment of sporting activities. Although a location for the new Redskins stadium complex has not been chosen, BIG has already developed a design, which was unveiled on US television show 60 Minutes yesterday. A scale model of the proposal shows a bowl-shaped stadium with a wavy outer wall, surrounded by a moat crossed by angular bridges. 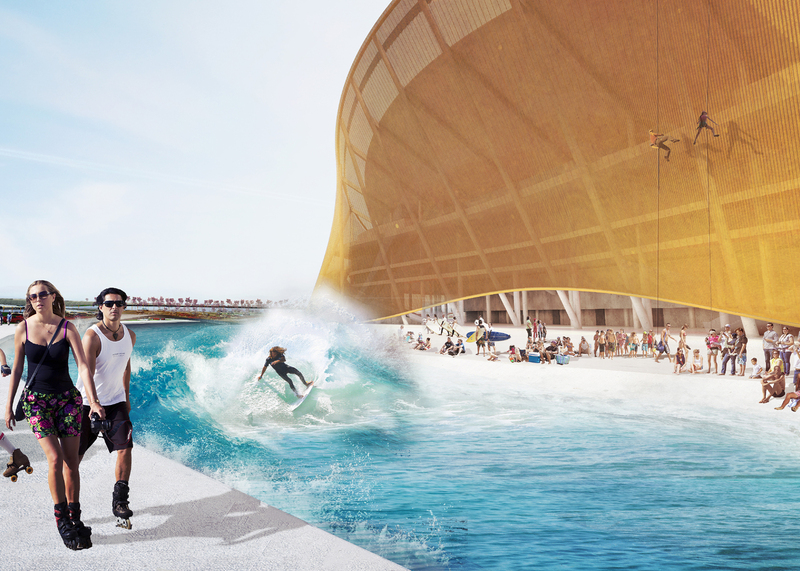 BIG has also revealed a rendering showing surfers, rollerbladers, kayakers and abseilers. According to Ingels, the "very practical" design is intended to cater to a wide spectrum of activities before and after football games. "The stadium is designed as much for the tailgating, like the pre-game, as for the game itself," said the Danish architect. "Tailgating literally becomes a picnic in a park. It can actually make the stadium a more lively destination throughout the year without ruining the turf for the football game." BIG was first linked to the Redskins project in January, fuelled by an earlier post on Ingels' Instagram account showing M&M candies emblazoned with the Redskins' controversial mascot — an Indian chief. The firm would not confirm the rumours at the time, stating only that it was working on a National Football League stadium for an undisclosed client. The Redskins currently play at the FedEx Field, an 82,000-seat arena in Maryland designed by HOK Sport in the 1990s. The stadium has been criticised for offering bad views from certain seats, forcing fans to stand up, and for being difficult to reach by public transport. The new stadium is expected to be built in the Washington DC metro area. It would be BIG's first stadium, so the firm would likely be paired with an office with experience in designing NFL facilities. Copenhagen-based BIG is rapidly expanding its presence in the USA and Canada, having released a series of new designs over the last two years. It is partnering with Thomas Heatherwick on the new Google headquarters and working on a skyscraper for New York's Hudson Yards. It also has numerous projects underway, including the Via 57 West tower in New York and the overhaul of the Smithsonian campus in Washington DC.